If you have any questions or want to enquire about dates, use our form to contact Lucy Wakefield or see their website for more information. The stuff of serious French country house envy! An attractive, stone-built Maison de Maître, topped with red terracotta tiles and flanked by a charming courtyard – probably built for a 19th-century lawyer. Careful renovation and decoration means its rustic appeal isn’t masked by its mod cons; families can really relax and enjoy themselves here in uncluttered, stylish comfort. Bedrooms are dreamy and deeply comfortable in warm greys, natural wood and stone, with antique beds and richly coloured rugs. There’s a sleek modern Italian shower room, a big claw-foot tub in the bathroom and a gorgeous living room with huge, duck egg blue linen sofas. Concoct feasts from your local market shopping in the well-equipped kitchen, complete with brocante finds and wood-burner, and gather round the big, friendly farmhouse table. Outside is the fabulous heated pool, the barn full of ball games, the acres of lawns and orchards… and the pretty detached cottage for two. Tear yourselves away to go walking, visit St Emilion and the chateaux, villages and prehistoric caves of the Dordogne valley. Lovely. Smaller parties welcome - please ask for rates. Minimum stay: 3 nights. 7 nights in high season. Short breaks available. Pets by arrangement. Dinner, 3 courses, £40. Restaurants 3km. The whole family - from 7 months to 70+ had a completely wonderful time at Fonqueyrade; we couldn’t have asked for more. The house is beautiful, spacious, comfortable and well equipped. The gardens are enormous and the lovely warm pool was the centre of much fun and laughter. 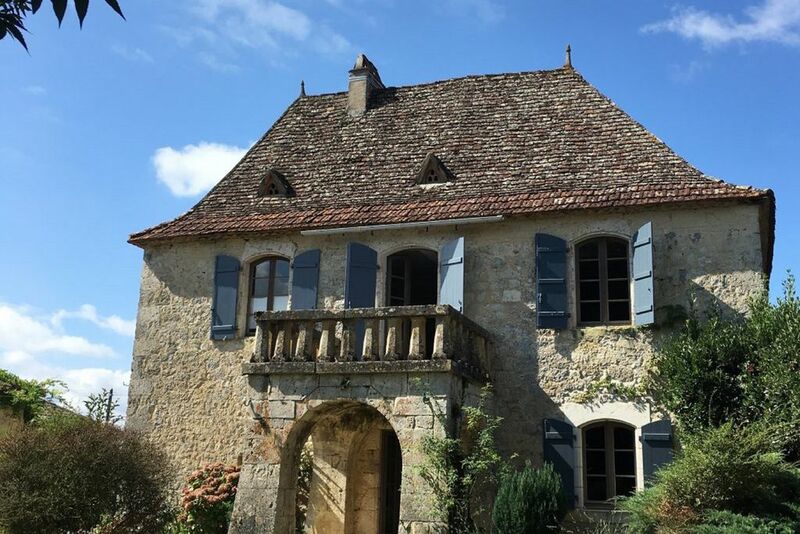 There is plenty to see and do in the area - local markets in Villereal and Issigeac; we also had a day trip to Beynac-et-Cazenac with a boat trip on the Dordogne. But, the best part was simply being at Fonqueyrade. Situated between the medieval Bastide market towns of Issigeac and Villereal, perfect for browsing and shopping. Children and adults will love a day out kayaking at Tremolat on the Dordogne. Pack a picnic and stop off on a small island for a proper adventure. Surrounded by beautiful countryside and some fantastic historic towns such as Monpazier and Monflaquin. Spend an afternoon in market squares and side streets having a coffee or an ice cream. Visit one of the many brocante markets, or spend an evening eating at a food market, there are so many opportunities to immerse yourself in French culture.